This is an advanced annual training opportunity for professionals interested in deepening their understanding of health financing policy options. "The course sets a new standard for delivering a training programme. Room for improvement? I'd change as little as possible," said Jaakko Yrjö-Koskinen, Ministerial Counsellor, Ministry of Social Affairs and Health, Finland. "The most useful part is now having a framework to think about health systems," commented Dirk Göpffarth, Head of Risk Adjustment Unit, German Federal Social Insurance Agency. "I found the country cases most useful and they helped us to not only think about models, but the context and the right moment to introduce reforms," added Svetlana Cotelea, Deputy Minister of Health, Republic of Moldova. "This is an amazing course: extremely well rounded yet compact, built on a strong scientific and theoretical base brought to life via in-depth, reform-specific country cases and very dynamic, participant-driven presentations. As a policy-maker and policy researcher, I took away a lot," said Anna-Marie Vilamovska, Secretary for Science and Health care to the President of the Republic of Bulgaria. 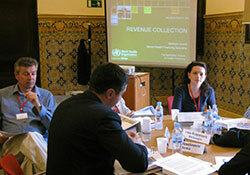 The special theme of the course is universal health coverage. The course puts global and regional policy experiences in context for European Member States and reviews the most effective policy instruments for moving towards and sustaining universal health coverage. "The knowledge gained on this course – including how to manage a demanding political context and prepare long-term plans – will be extremely valuable in Croatia. We are grateful for the excellent trainers and very interesting course content, as well as the opportunity to make very important networking connections," said Tatjana Prenđa Trupec, Deputy Director of the Croatian Health Insurance Fund.